As part of Personal and Professional Development, a group consisting of 5 members from the Samdrup Jongkhar Initiative (SJI) took part in a two-week summer retreat (Dathun) from 15th to 28th, August 2018 at Deer Park Institute, Bir, Himachal Pradesh. This program was led by a team of Buddhist instructors under Dzongsar Khyentse Rinpoche and Chogyam Trungpa Rinpoche. The Dathun provided the unique opportunity to practice sitting meditation including morning and evening chants, walking meditation, silent meals, silent periods, functional talking, meetings with senior meditation instructors, and dharma talks. It was a special opportunity to explore and understand our own minds and the world around us without pressure or distraction. As intended, the Dathun provided that space of simplicity and clarity, which is rarely manageable in our day-to-day work place and mundane lives. This indeed was our main purpose of this Dathun participation to have that personal space. For much of the day the participants were together in complete silence. There was also unscheduled open times for us to read, take walks or just sit and relax. There were also some household chores or kitchen work at regular intervals as a part of practice. 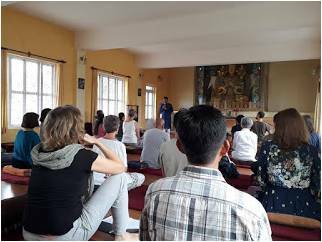 The program was designed to follow the traditional program guidelines: that there be no music, no drinking of alcohol or taking non-prescription drugs, that reading materials are dharma books only, and that we take part fully in the schedule. Although we were not able to continue the month-long Dathun because of time constraint, the first two weeks of participation gave us the taste of what it is like to watch our mind and body with total focus and discipline.